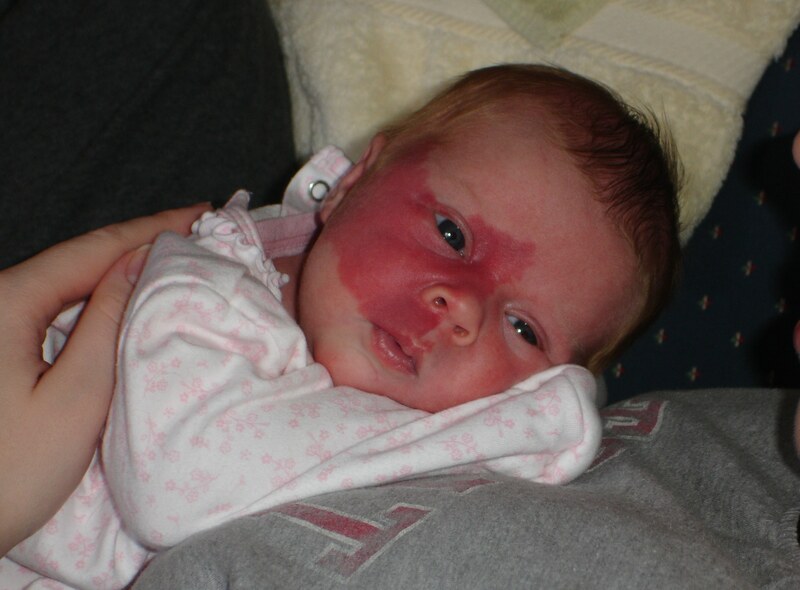 When We Thought About Treating Baby Addy’s Port Wine Stain… | What Happened To Her Face? A) If we treat this, then she won’t get made fun of as much in school – yay! But then again, maybe someday she’ll hate us for taking away a distinguishing mark that was rightfully hers…? B) If we leave it so that she alone can decide its fate when she’s older, then the damage will be done, both physical (as it may have grown too thick to treat completely) and emotional (as she will have already endured early childhood with immature classmates and the inevitable questions and teasings). So there we are, with the fate of our daughter’s face in our hands. Obviously, we’ve decided to zap it off. (And we don’t regret it.) We’ll either get a sincere “Whew, thank you, Mom and Dad, for thoughtfully removing the mask so that people can see the true beauty of my face! I’m so glad I get to look like everyone else at prom!” …Or, we’ll get a dramatic “I CAN’T beliEVE you took away the ONE THING that made me unique! Now NO ONE will EVER notice me!” and then she’ll run upstairs and slam her bedroom door and blast whatever emo music the teenagers will be listening to at that point. Posted on August 22, 2013, in 3. Addy Stories & Experiences and tagged Humor, Parenting, Treatments. Bookmark the permalink. 13 Comments. Thank you for your knowledge and experiences, and being a source of strength and wonder to your precious Addy. Children learn what they live, and your wonderful ways has made a huge difference in how incredible your Addy has become. I am the mother of a 16 month old daughter with a PWS. I have been meaning to write this for over a year now, but never could find the right words to express my full gratitude. When researching PWS, I was blown away by your blog, and how I have lived those same awkward moments too, and making decisions about the laser treatments etc. We have began the laser treatments, at 8 months, and we were told they could have actually started earlier. It’s a 5 minute scream fest, but the cream freezes the area, and then the treatment is done. The doctor asked for the next treatment if we wanted her to have general anesthetic so they could get closer to her eye. However doctor told me the drug they used is propofol, and proceeded to tell me this was the drug Micheal Jackson died of! Seriously not a thing a mum of a 16month old wants to hear, and I was taken aback. I wanted to know how you coped with the general anaesthetic and the risks involved? Thank you for your blog, it’s helped me a lot. My son developed a tiny hemangioma on his face a couple years ago, and we got that lasered in the clinic without anesthesia (just numbing cream & sunglasses). It was our first time seeing & hearing the machine go ZAP! ZAPZAPZAP! ZAP! And that’s when we really understood the anesthesia; the zapping is so loud and invasive! Addy’s PWS is big enough that the treatments would be absolute misery without the anesthesia, and since we knew that she would require many treatments, we’re glad they’re not miserable. She loves going in for her laser surgeries! Addy has, however, decided that she loves her port wine stain and wants to keep it, so we’ve slowed down treatments. We’re trying to keep as much of it as possible while still keeping its growth in check, especially around her eye, so it’s a bit of a balancing act. But we are thrilled that she wants to keep it! We feel very comfortable with the anesthesia. All of Addy’s treatments are at a Children’s hospital, where the doctors are experts in small humans, and they understand the art & science of dosing. Addy’s doing brilliantly in school, and we’re not worried about any long-term effects, which is saying something after 42 laser surgeries. Please feel free to email me any time! I’m at whathappenedtoherface@gmail.com, and am happy to answer any questions you have along your journey. (And I’d love to hear about how it’s going! My dad has a port wine stain that covers the majority of his face, and since I’ve know him my whole life I never think about it. I think he looks beautiful, birth marks are nothing to be ashamed of. New Mom here (less than a week), and my little girl has a PWB on her face. I was wondering if you had a tips on how to deal with insurance with the laser treatments? My first recommendation would be to find a specialist first who has treated a lot of port wine stain kids; their office will be experienced in dealing with insurance rules, and they can help give you guidance through the whole process. The specialist’s office will give you a diagnosis code (what they’re treating) and a treatment code (how they’re treating it). You’ll want to give those codes to your insurance company first, to see if treatment is covered. In my experience, it usually is, as long as your doctor can prove ‘medical necessity’ – more on that below. Your insurance company can guide you to the next steps you once they know the codes. Note: In some states, the law decrees that treatment of kids’ port wine stains must be covered. I don’t know the details on that, since I don’t live in one. But your specialist’s office will know if any such law applies in your state. Once the insurance company has your letter of medical necessity on file, you should be set. However, when we started treating Addy (at 5 weeks of age, then every month thereafter), the insurance company was often “behind the ball” – in other words, they hadn’t recorded the ‘letter of medical necessity’ by the time the first surgery was billed, so they rejected it; and I had to push back, pointing to the letter, which they then found & recorded and paid for the procedure, but not before another procedure had taken place, which they also promptly rejected. (A quick phone call reminding them that they covered this procedure, and that they had an accepted letter on file, straightened everything out.) After a few cycles, we were all on the same page, and biling was easier. I recommed doing surgeries once every three months. Many years ago, when doctors were figuring out that lasers could treat port wine stains, they grabbed an arbitrary, “well, this would be good if done, say, every three months.” Over the years they realized that hitting the stain harder, earlier, with more frequent zappings was actually much more effective; but the original recommendations (which are used to determine insurance coverages) weren’t changed. As a result, many insurance companies won’t pay for laser treatments that occur within less than 90 days of each other. So, unless your specialist can fight that 90-day battle for you: don’t take chances. Keep them 90 days apart. My final tip: always be kind and courteous. When yet another surgery was being rejected and I had to push back, calling them up and pointing out that they had paid for the last 8 surgeries, so they shouldn’t reject the ninth, I was always forced to begin with some poor kid on the 1-800 customer support line. If I was rude and demanding, they could shut me down: “Sorry, can’t help, it says here ‘not covered. Case closed, thank you, goodbye. '” But when I was polite, courteous and understanding, they helped me escalate my problem: “Wow, you’re right, we’ve totally covered the last 8, let me send this ninth one back for re-processing. Sorry about that, ma’am.” The person on the other end of the phone line is a human being, and remembering that will help you navigate at critical moments. Please let me know if you have any other questions, concerns, or random thoughts! If you’d rather not share them here, my direct email address for my blog is whathappenedtoherface@gmail.com. …By the way, I’m afraid I have no idea why my note formatted so strangely. Sorry it’s hard to read! Your daughter is beautiful. Thank you for sharing this – found you through a google search, researching for my own child. How did it go with the laser treatment? My son who was born in December 2013 has a port wine stain on the right side of his face. Our specialist, however, doesn’t recommend (or won’t do) laser therapy until he’s older, like 7 or 8 when he won’t need full anesthesia. As far as treatments go, I would personally recommend starting as soon as possible. The blood vessels that make up port wine stains grow with the child, so over the next six years it will get thicker and darker, and harder to treat. If you can start the “weed whacking” early, when the blood vessels themselves are still younger & smaller, the overall treatment process is smoother; that is, he’ll probably need fewer treatments over a shorter span of time. Some doctors want to avoid anesthesia, and recommend waiting until the kid is older. I don’t agree, because by the time they’re seven or eight they will have spent their whole early childhood (such formative years!) with a dark (and getting darker) mask on their face. Meanwhile, even a few early laser treatments, done while the PWS is still young, can at least reduce it to a pink mark (“Didja get a sunburn?”) instead of a red mask (“Whoa! What is that!!?”). The benefit of avoiding anesthesia, for me, doesn’t outweigh the cost to the child’s first six years of emotional development, social interactions, growing self-awareness, and the identity they develop. (“I’m ‘that kid.'”). We started Addy’s laser treatments when she was five weeks old, and we went monthly for over a year. We slowed down after that, but still continue to go regularly. She has had over 30 laser treatments before her seventh birthday, all under anesthesia. Your doctor may be reluctant to do anesthesia because they are aware of recent research in the last few years that has shown a connection between repeated trips under anesthesia and increased ADD in children (and perhaps some other complications as well, I can’t remember). However, that research didn’t take into account the fact that children who go under anesthesia repeatedly often have other conditions, much more complex than a port wine stain, that are likely to impair cognitive and emotional development. All the PWS kids we’ve met who got it treated early are perfectly high-functioning kids, and Addy’s doing fabulously in school, so it doesn’t worry me. We loved seeing early progress with Addy! Hers was really dark, and the lightening of it was encouraging. Hello! My son turned 1 month today and he has a PWS on I/4 of his face: half his forehead down to his eyelid. They won’t start lasers until May because he needs anesthesia to shield his eyeball. I’d like to start asap, but that’s what they recommend. We still have to see the neurologist, but the other drs have given good reports so far. So hopefully we are just dealing w it as a cosmetic issue. And I think it looks worse in any photos I take! Ugh. Thank you for sharing your experience. We are using the drs at lurie children’s in Chicago. Thank you so much for all of the information! I called my son’s specialist at Sick Kids in Toronto and spoke to the nurse who is in charge of the laser lab there. They’re going to set up an appt to talk in person and get him on the list to have the treatment. He’s already had an MRI to scan for any abnormalities with his brain (thank God there’s nothing), ditto with the ophthalmologist – so hopefully that will alleviate any concerns with anesthesia. The way the dr explained it, laser treatment didn’t seem to be an option until DS was older. Reading that the PWS gets worse with time is alarming. He’s 14 months and already people ask about his face. Right now the PWS is fairly light, so most of the time it looks like a rash or a sunburn. Can you share some more about the treatment process, and any advice you have on how to handle the questions and help him in social situations is much appreciated.